If bighead and silver carp were to establish in Lake Erie, local fish biomass is not likely to change beyond observations recorded in the last three decades, according to a study published in the journal Conservation Biology on Thursday (Aug. 6) by a group of scientists from the University of Notre Dame, Resources for the Future, U.S. Forest Service, University of Michigan and the NOAA Great Lakes Environmental Laboratory. “Bighead and silver carp will continue to have access to the Great Lakes — it is important to understand what the consequences could be if they were to establish,” Marion Wittmann, the paper’s lead author and University of Notre Dame scientist, said. Since 1995, at least three bighead carp have been recovered from Lake Erie. There is no evidence to date whether bighead or silver carp are established in the lake. To estimate Asian carp impact to Lake Erie fishery biomass, the Notre Dame study used expert elicitation, a process of formalizing and quantifying experts’ judgments and a method designed by co-author Roger Cooke, senior fellow with Resources for the Future. Federal agencies such as the U.S. EPA, NASA, U.S. Army Corps of Engineers and the U.S. Department of Transportation have successfully used similar expert elicitation in support of risk analysis and decision-making on issues ranging from food safety to radioactive waste management. 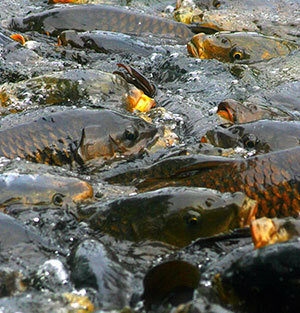 Eleven experts estimated that if the carp become established in Lake Erie, bighead and silver carp biomass in the lake could range from close to zero but up to more than 25 metric-tons per square kilometer, which is greater than the sum of walleye and yellow perch biomass in Lake Erie. Experts estimated that yellow perch biomass would not decrease as a result of bighead and silver carp, and could possibly increase by 15 percent to 50 percent of recently recorded biomass for this fish in Lake Erie. Experts estimated that walleye biomass would most likely experience a small decrease of about 10 percent in Lake Erie. However, experts were uncertain about this value and estimated it is possible that walleye could decrease by as much as 40 percent, but could also increase by more than 60 percent of its recently measured biomass. The authors emphasize the importance of decision-makers considering uncertainty. “The range of possibilities concerning walleye biomass shows that the potential effect to this species is highly uncertain,” Cooke said. 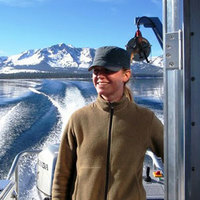 This study is part of a research award from NOAA National Centers for Coastal Ocean Science (NCCOS) to Lodge and the University of Notre Dame Environmental Change Initiative with funds provided to the NCCOS Center for Sponsored Coastal Ocean Research by USEPA Great Lakes Restoration Initiative. Originally published by William G. Gilroy at news.nd.edu on August 07, 2014.